We have been working hard to improve the SAILS tests and the results of all of that work will become available beginning in June. Here are the changes you can look forward to for the next academic year. May we use your responses for our research project? Only students who agree to allow their response to be used will be included in your report. This option is available for both the Cohort and Individual Scores versions of the SAILS tests. Currently you have only been able to include up to nine responses for each of your custom demographic questions. Beginning in June you will be able to include up to 50 responses per question. This will allow you to ask more complex questions and report out in more detail. This change is available for both the Cohort and Individual Scores versions of the SAILS tests. Beginning in June, when you complete an administration of the Individual Scores version of the SAILS tests, you will be able to download an additional spreadsheet with benchmark data. The benchmark will include data for the previous three years. The spreadsheet will include benchmarks for similar-type institutions, institutions in the same country, all institutions, and, optionally, your pre-defined consortium. There will be an overall table for these benchmarks by demographic variable as well as a table with details for each item in the version of the test you administered. When you complete the administration of an Individual Scores test, your report of student performance comes in the form of a spreadsheet. We realize that conducting extensive analyses of the data is not an easy task so we have created a guide for this purpose. The guide offers advice and step-by-step instructions for working with the data in SPSS to answer questions about how performance varies across various factors, such as majors and class standing. The guide will be available in June. With these enhancements comes a price change, although we will continue to keep our pricing affordable and easy to understand. The new price for the Cohort version of the SAILS test will be $5.00 per student up to 1,000 students and then $5,000 up to 5,000 students. There is still a minimum of 50 students required. The Individual Scores version of the SAILS test will be $6.00 per student up to 1,000 students and then $6,000 up to 5,000 students with no minimum number of students required. The price changes will go into effect on June 15, 2014. The SAILS tests remain the most economical way to assess your students' information literacy skills. Proposal deadline is March 1, 2014. Poster session proposals due March 4, 2014. 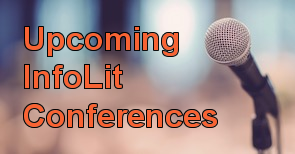 See the full list of information literacy conferences and calls for proposals. The test questions themselves cannot be changed and no test questions can be added. The calibrations, scoring, reliability, and reporting all depend on having one set of validated test questions for all participants. However, we do offer the option for participants to slightly modify two standard demographic questions and to create two custom questions. All test administrations have two standard demographic questions, class standing and major. Shown to the right is a screenshot test administrators see when completing these standard demographic questions. 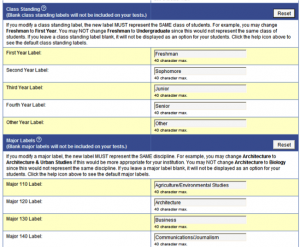 Test administrators can re-name class standings and major labels to fit their institution. 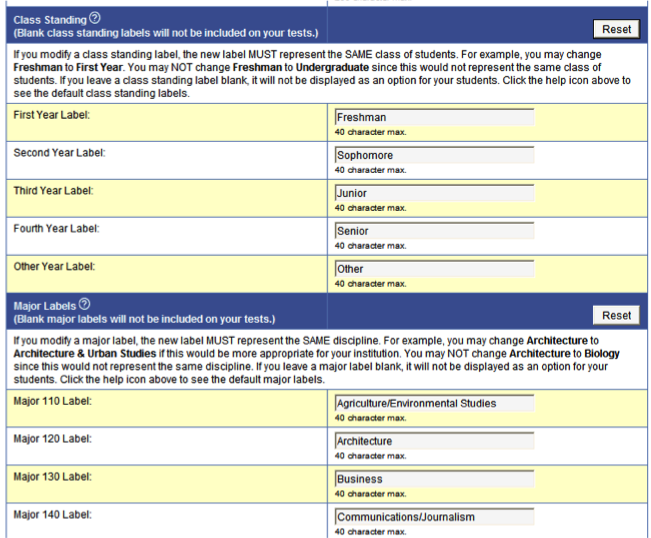 Another option is to delete class standings and majors that are not needed. These changes allow each test administrator to customize class standing and major labels to match the terminology used at their institution. You have the option to create two custom questions of your own choosing. Each question can be up to 255 characters long (typically 30 – 40 words) and with up to nine responses of 40 characters each. In June 2014, the number of response options will increase from nine to fifty. Custom questions not only allow test administrators to learn more about the students taking the assessment, but they also make the data received more valuable. By having additional information about test takers, administrators are able to slice the data in more ways in order to develop additional findings that can lead to positive changes in instruction. 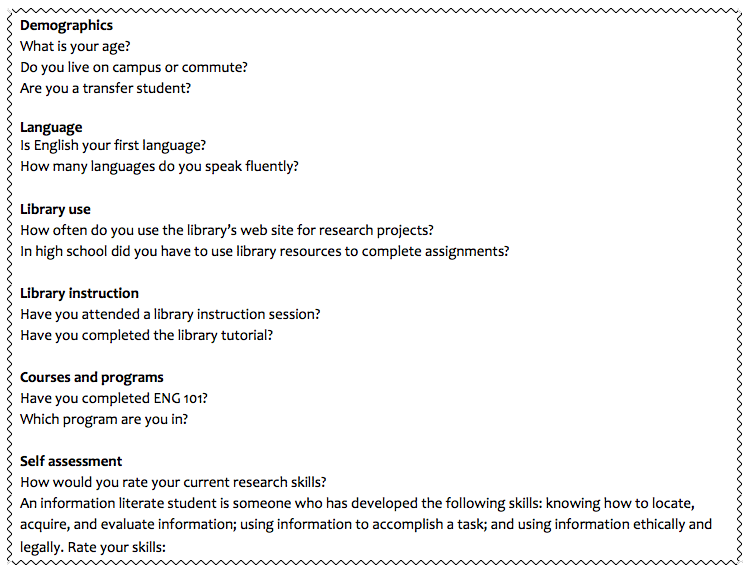 For example, by asking if students have received information literacy instruction from a previous course, test administrators are able to understand if these courses are having a positive impact on the information literacy skills of these students versus peers who have not received prior instruction. Project SAILS is dedicated to providing valuable data to testing institutions and we have seen the addition of custom demographic questions provide additional value to those utilizing them. We hope that whether you are setting up your first test administration or your tenth, you find a way to utilize custom demographic questions to their full potential. Ready to start? Register for a free account and begin your test administration today!